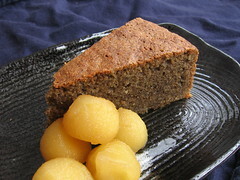 Buckwheat Cake with Cider Poached Apples - Do You Know The Muffin Man? Notes: This isn't a gluten-free cookbook, but as far as I can tell, this recipe contains no gluten. I used organic Orin apples from BC which have a subtle pear flavour. Poaching the apple balls in spiced cider gave them a deep flavour, and they make a nice accompaniment. The nutty cake tastes of buckwheat, as expected, but its moistness and soft texture surprised me.